I was approached by the lovely people from Belgibeer about their amazing subscription box. One that all my male companions were envious of. It's a Belgian beer subscription box, described as "A new Belgian beer experience." The beer box is a monthly subscription to 8 bottles of craft Belgian beer, complete with coasters, a magazine, a beer glass/chalice and complimenting snacks. The website explains how in Belgium, each brewery will make their own glassware which corresponds to the texture of the beer that is to be poured into it, so basically - it compliments the beer! While I am not a beer drinker, I appreciate many have a passion for all the varieties and textures of beer. 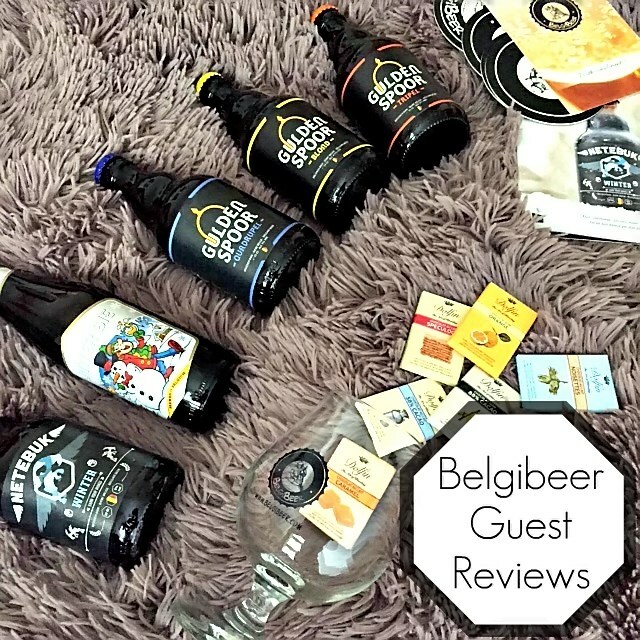 The creators of Belgibeer often have themed or seasonal boxes, one of which was sent to me to try and I have to say the Xmas Box was a hit with my guest reviewers. "The Netebuk Winter is a nice dark, slightly carbonated stout. With a coffee & chocolate aroma, it is very smooth on the palette,with spicy/warm notes initially and a very slight nutty/hoppy after-taste. With an abv of 8%, it doesn't taste too strong but has enough about it to keep it interesting. A very nice stout in general." 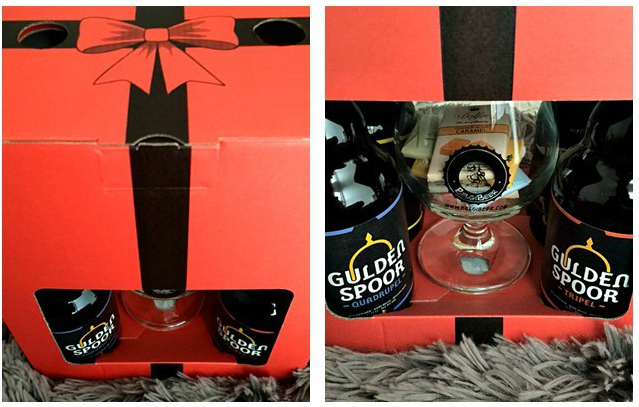 "The Gulden Spoor Quadrupel is a sweet strong ale with a slight hoppy and citrus after-taste. Deliciously dark amber in colour with a superb sweet honey taste. It is very light at first with the sweet, citrus taste masking the fact that this ale is a whopping 9%. Which is strong enough to get you smashed on 2 sips if you haven't eaten." "The Gulden Spoor Tripel is a light pale ale with a good combination of hoppy and citrus after-taste. As with other Spoor beers, it is very light at first with a sweet, citrus taste masking the overall 'hoppiness' of the beer. A great pale ale beer for experts and beginners alike!" "Crisp, refreshing and easy to drink. Citrus notes upfront, with a more hoppy aftertaste. Pleasant enough, and I'd have another...but nothing to majorly recommend it over 100 other beers." As I don't drink beer, I chose to do what I do best - eat. The box came with six moderately sized chocolates from Dolfin. I would describe these to be the perfect size, none of this Quality Street bite-size nonsense. These chocolates were really unique in that their flavours varied greatly. Two of the chocolates varied in cocoa percentage, my favourite being the dark chocolate as it's my go-to plain flavour. I find milk chocolate becomes sickening after a while, whereas I can eat dark chocolate until it came out of my ears. Other flavours included orange, caramel, noisettes (which is hazelnut but my good friend and colleague Mark who reviewed the Netebuk Winter turned this into a tireless vocal recollection of the band The Noisettes and went on to sing this across from my desk..) and also Speculoos which I discovered was the Lotus biscuits you get with your coffee, and out of them all was my ultimate favourite. I also received this gift box which was designed to hold four beers inside with the choice of an extra fifth beer or a glass in the middle. Perfect! The subscription is only £24 a month for the 8 beers, coasters, magazine, snacks and glassware, which I believe to be quite a good deal, especially for craft beers. My box came with 5 beers but please note the usual subscribers boxes come with 8. The Xmas Box will finish after the 5th January but Belgibeer have a New Year's Box available, and also a Valentine's Box in February.